Del Toro’s latest film does more than any of its predecessors to bring together the two strains in his work. Crimson Peak is a lushly designed and photographed 19th Century Gothic romance into which the director’s patented watery ghosts impinge at key moments. As with Pacific Rim, Del Toro is using his industry clout here to explore and embellish a favourite genre. The presence of Mia Wasikowska as the heroine adds emphasis thanks to her earlier excellent turn as Jane Eyre in Cary Joji Fukunaga’s 2011 adaptation of Charlotte Bronte’s novel (not to mention her Emma Bovary in Sophie Barthes’ 2014 adaptation of Flaubert). As in The Devil’s Backbone and Pan’s Labyrinth, Crimson Peak has a vulnerable newcomer arriving at a gloomy place which hides violent secrets. Wasikowska is Edith Cushing (a nod to the horror genre’s lengthy history perhaps, referencing the great Peter Cushing), an aspiring writer who is seduced by the dashing but somehow not-quite-right Thomas Sharpe (Tom Hiddleston), a British noble fallen on hard times who has come to America looking for money to back his invention, a machine to mine the special clay on his estate back home. When he is rebuffed by Edith’s father, a self-made businessman who smells a rat, dad suffers a nasty fate and Edith marries Thomas and returns to the decaying estate. This looming, collapsing edifice almost overwhelms the characters with its labyrinthine design, which includes a spooky cellar full of vats of liquid clay which suggest nastiness to come, and a huge hole in the high roof through which dead leaves, rain and snow trickle down constantly. Thomas’ sister Lucille (Jessica Chastain) is less than welcoming, her hostility towards Edith increasing as Thomas’ attraction to his bride becomes more pronounced. Ghosts appear to warn Edith of imminent danger, and nasty family secrets are gradually revealed. The basic elements of the narrative are more conventional than those of the Spanish films, but Del Toro manages to introduce unsettling notes of madness and violence (in one instance as nasty and disturbing as the wine-bottle moment in Pan’s Labyrinth) into the Bronte-esque plot. 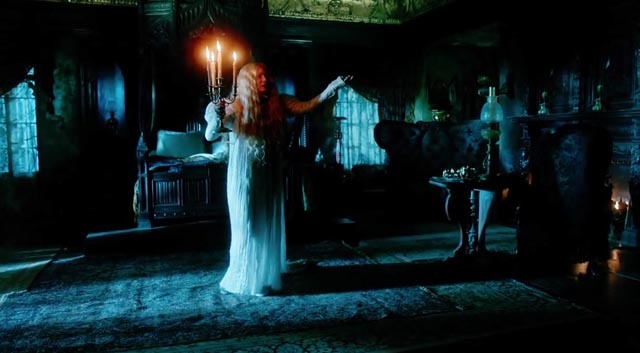 And Crimson Peak is gorgeous to look at, Dan Laustsen’s photography loaded with saturated colours and deep shadows. Del Toro’s lush, emotional romanticism is a far cry from Stanley Kubrick’s cool detachment in his big haunted house movie, The Shining (1980). For me, it’s also a more successful approach to the intersection between psychology and the supernatural. 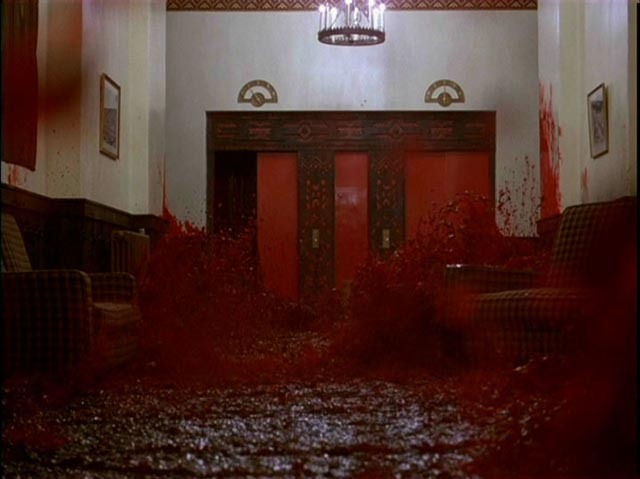 Readers of this blog may recall that I have problems with The Shining, a film which fascinates and infuriates me in equal measure. Looking perhaps for a way to resolve these conflicted feelings, I recently read with great interest a massive (750-page) study of the film edited by Danel Olson and published by Centipede Press as the latest in their Studies in the Horror Film series. Collecting articles, essays, reviews and interviews from the ’80s to the present, this impressively mounted book is almost but not quite exhaustive – while the interviews include Kubrick himself, a wide range of technicians and performers (down to bit players with little more than a walk-on), author Stephen King is conspicuous by his absence. Although his dislike of the film is well-known, it would have been interesting if Olson had provided an opportunity for the writer to re-evaluate his opinion or at least illuminate again in this context just what his problems with the film are. Perhaps a bigger absence is Vivian Kubrick, the filmmaker’s daughter who, as a young woman, shot the fascinating behind-the-scenes documentary which has turned up on many of the film’s disk releases. For me, the most interesting parts of the book are those which dwell on the craft involved, with Kubrick’s obsessive attention to detail dissected in a number of areas – production design, cinematography, editing, sound and music. The latter in particular is given detailed examination in a 50-page essay on the music by Christine Gengaro and a 20-page interview with assistant editor and music supervisor Gordon Stainforth. The book inspires a real appreciation of Kubrick as craftsman. The interview with co-writer Diane Johnson, however, highlights a fundamental conceptual difficulty which was never resolved either through the process of adaptation or subsequently during production: the status of the supernatural and its relation to the story and its characters. It seems quite apparent that Kubrick had little affinity for the ghost elements of King’s story, and yet was unable (for obvious reasons) to abandon them entirely in favour of his preferred psychological approach to the material. The many perspectives in the book provide a not surprisingly conflicted portrait of the director. It’s obvious that many of those who worked with him adored him – and yet many of these same people ended up feeling used and burned-out, and left the film before its long production was over. He comes across as incredibly demanding and very unforgiving. All that mattered was getting on film what he wanted, no matter how hard the process was on those working for him. And yet, despite what I’ve learned from this book, I can’t say that it’s changed my opinion of the film at all. Yes, it’s a visually stunning work with an intricate and haunting soundtrack … but it fatally fudges its approach to the supernatural, trying to have it both ways (as a psychological study of a dangerously unbalanced man and at the same time a haunted house epic), and falling between two conflicting poles. And no matter how much I read or hear about what he was trying to get from Jack Nicholson and Shelley Duvall as the troubled Torrances, neither actor convinces me for a minute. They remain caricatures, collections of actors’ tics and directorial signifiers, perhaps the one clear confirmation in Kubrick’s work of the often-leveled accusation that he was as a filmmaker almost inhumanly cold. This pair are mere puppets being put through a grueling wringer ultimately for no larger purpose than to create an intellectual idea of horror. Judging by a very small sample – a dozen features by Michael Haneke and Ulrich Seidl – I’ll make a sweeping generalization about Austrian cinema: it has a strong impulse towards formalism, and subscribes to a very bleak view of the world. This impression is further supported by a film which predates the most celebrated work of both those directors and which is, in some ways, even more radical in style and content than their better-known films. A more visceral conception of horror can be found in Angst, which was for me a completely unknown film until I recently came across the Blu-ray in a local store. It was made in 1983, a collaboration between Austrian director Gerald Kargl and Polish cinematographer and experimental filmmaker Zbigniew Rybczynski, who also co-wrote the script with Kargl and edited the film. Given the remarkable look and rhythm of the film, it’s impossible not to see Rybczynski as one of the prime creators, despite the solo directing credit of Kargl. But the subject is specifically Austrian, based on a very recent criminal case which had shocked the country. Troubled since childhood, Werner Kniesek repeatedly stabbed and almost killed his mother when he was sixteen. He was sentenced to four years in prison. When he was twenty-five, he walked up to a random house, rang the doorbell, and shot a seventy-three-year-old woman for no apparent reason. He was sentenced to seven-and-a-half years. Under Austrian law at the time, prisoners were allowed out for short periods during the last stages of their sentence in order to readjust to life, find a place to live, a job … and so Kniesek was released on a three-day pass, despite the fact he had told a psychiatrist that he had a compulsion to kill which he was unable to control. Within twenty-four hours, he had imprisoned, tortured and killed a middle-class woman, her physically and mentally handicapped son, and her daughter. Making no attempt to avoid capture, he was arrested the next day. He was sentenced to life in prison. Using the outlines of the case, Kargl and Rybczynski set out to make a film which gets inside the mind of the psychopath, to make his horrific acts comprehensible. The result is deeply disturbing, trapping the viewer within the killer’s psychological space in a way which is unpleasantly claustrophobic. The camera is literally tied to the killer, K (Erwin Leder), for much of the film – Rybczynski designed a rig for the actor to wear giving the camera the ability to circle him in close-up while walking, running or just sitting; this keeps the character uncomfortably close. Another rig, strung on cables which run overhead for hundreds of yards, permits the camera to track K through woods, along streets, with a disconcerting god’s-eye-view which, through the constant use of an inner voice, creates a peculiar psychological disconnection, as if K stands outside himself, watching his actions and commenting on them with chilling detachment. 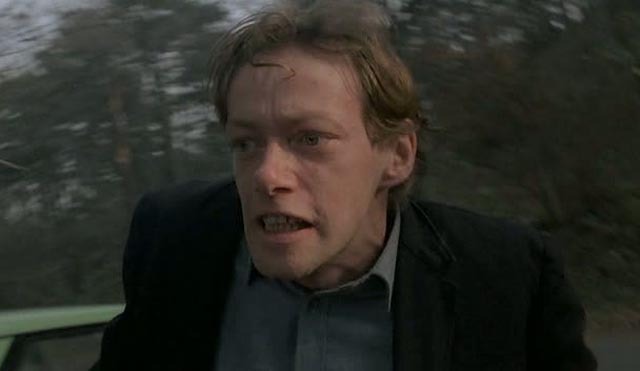 While there are several moments of graphic violence, the film is most disturbing for refusing the viewer any opportunity to stand back from K. Although Angst has sometimes been compared to Henry: Portrait of a Serial Killer, John McNaughton’s movie takes a more conventionally objective stance towards its protagonist, creating the possibility for some emotional distance through ironic, even satirical commentary. Kargl’s film refuses such distance. While unpleasant, Angst is fascinating for a number of reasons; foremost is the remarkable visual technique, but more lasting perhaps is Leder’s chillingly convincing portrayal of the psychopath. Cult Epics Blu-ray presents an excellent transfer of the film’s muted colour and unconventional soundtrack (actual sound is frequently suppressed in favour of K’s voice, adding to the claustrophobic effect). Supplements give a great deal of insight into the production and the filmmakers’ intentions: a commentary (a mixture of English and German) with film critic Marcus Stiglegger in conversation with director Kargl; an interview with Kargl conducted by filmmaker Jorg Buttgereit; an interview with Rybczynski; an interview with Erwin Leder; a brief introduction by admiring filmmaker Gaspar Noe; and an optional prologue depicting K’s previous crime, the shooting of an elderly woman, and a newsreel-like account of his life and crimes. This latter, quite extraneous, is best watched after seeing the feature itself. This entry was posted in Commentary, Review and tagged Directors, Film Criticism, Film History, Horror, True Crime. Bookmark the permalink. Modern trailers/previews seem to give much more of the plot than in the past. Often I hum a tune and avert my eyes so as not to know too much before I watch the movie. Basically, I want to know enough to decide to see it or not – nothing more. What do you think about this? When you write a review, do you concern yourself about ‘giving away’ too much? I decided I want to see Crimson Peak, so I stopped reading your review before the third paragraph ended. Regarding The Shining, likely my least favorite movie by my favorite director, I agree fully with your second last paragraph. Actually, rereading my comments on Crimson Peak, I think I kept it very vague and just talked about the set-up, rather than any details of the plot.